On top of the recent loss of Larry’s Hobbies in north Houston, comes the news that M&M Hobbies, a long-time fixture in Bellaire, is closing. I talked to the owner and he said they would be gone by the third week in August. Model railroad stuff is at %40 off and books are %20 off. Kits have not been discounted, but if spend enough money (say over $150) you can probably get a quantity discount. They still have quite a bit of paint in stock if you are in need of any, including Tamiya spray paints and Gunze spray Mr. Surfacer. Also, if you have a built model in one of their display cases, you need to go down to the store and get it. They have contacted those people they have info for, but there are still models that need to go home. 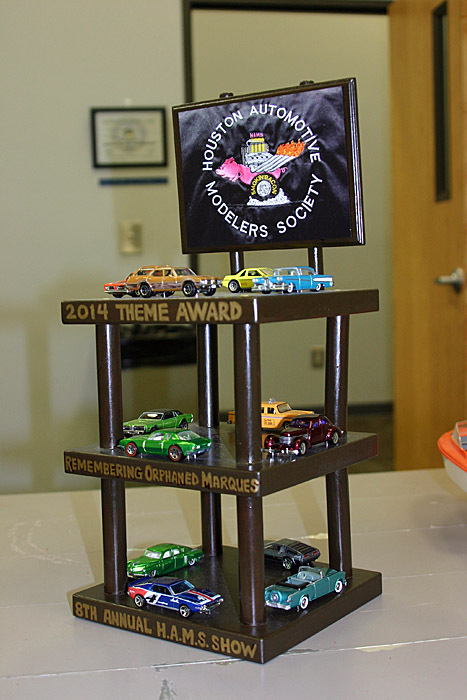 Our model car show is less than a month away. If you are interested in sponsoring a contest category or being a vendor at the show, there is still time. Full show information can be found on our Contest Page. Don’t forget our contest theme of “Remembering Orphaned Marques”.